Elvin is at it again. The evil Professor Elvin Atombender, the genius with a long streak of mental instability, is plotting to destroy the planet. Ensconced in his heavily guarded tower, protected by robot killers, he appears to be too isolated to stop. This is where you come in. The name of the contest is Impossible Mission II, Epyx's sequel to the Impossible Mission game that came out a while ago. You are a government field agent who must set out to break Elvin's defenses, get to the pieces of music strewn throughout, then enter the control room to stop the launch of the missiles that will end the world. One thing to remember is that the game is very aptly named: It may indeed be a task impossible. Another nice feature they provide is the ability to run Impossible Mission II off a hard drive. Elvin has filled his fortress with many obstacles and implements of destruction; his best shot to keep you away from his control room. A slew of robot warriors pace back and forth through each room, protecting all the pieces of the puzzle you have to gather. You'll have to search behind each chair, picture frame and, most of all, locked safes (where the music is stored), to keep your quest alive. Hidden by these items, you'll find such necessities as mines (to take out the robots and blast holes in the floor), light bulbs (to illuminate darkened rooms) and bombs (for blasting open a safe). By far the most important gathering you make is colored numbers. The correct set of three numbers must be completed before you can exit the tower you are in; each of the eight towers must be finished in the same manner. Lastly, you must assemble the six different snippets of music (there are two duplicates to throw you off even more), which will allow you to pass through to Elvin's computer room. Once there, you have to pick one of the three terminals and disarm the rockets; only one will do the job, and the other two are electrified in an attempt to further hinder you. I guess you can tell that you have a lot ahead of you before you finish. Oh, did I tell you that you are also under the constraint of a time limit? Yes, eight hours are all the time you have to do your dirty work. And one thing the documentation doesn't tell you is that each time your character dies—either by being fried by a robot's laser or falling to his demise—a few minutes are extracted from the time limit. All of the impediments in your path would seem to be enough to keep you from getting anywhere near the end of your mission. 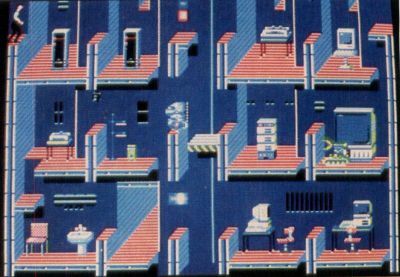 No doubt, if you could make a careful map of each room, plotting out a strategy and path to get around each robot, and where each important item is located, much more could be completed. Unfortunately, they even scramble object locations, so you're out of luck. The key is not to stay in one place too long, wasting ticks of the clock. There is a game-save feature, so you can creatively help yourself out anyway. Just the same, as discouraging as the constant downfalls can be, it is a ton of fun to tramp around the towers, leaping and running all over the place. Each room offers a separate challenge, all the while accompanied by lushly designed graphics. Little details will leap out at you, such as when your character strolls in front of a mirror, and you see an accurately depicted reflection in it. The animation of your agent flipping over things, sliding up and down or back and forth on moving platforms and falling through holes in the floor—the latter accompanied by a frightening, digitized bellow—are well done. Another nice feature they provide is the ability to run Impossible Mission II off a hard drive, though you must use the original floppy as a key when loading it in that way. Software companies should take this path in bringing their games to market, what with more computer users going the hard-drive route, particularly on the basis that many of the new generation contests require a large chunk of time to load. As a final note, the documentation is simple but gives you enough background and detail to make the game play easy to understand. Though you can't simply boot-up the game and play—there are certain keys that have an integral purpose, and knowing how to search for objects is not easily discovered without docs—there isn't much to keep track of. Epyx has, through the programming talents of Hungary's Novo-trade Studios, put together a challenging test of a player's ability and will. Though most gamers will be frustrated and often discouraged by the program's difficulty, it will stretch your talents in addition to being sharp to look at.